Model: GX 007. Lens Width: 51 mm. Color Code: GRN. Temple Color: Green. Bridge Width: 16 mm. Lens Diagonal: 50 mm. Accessories: No case. Temple Length: 135 mm. Color:Green / Havana. MADE IN FRANCE. Model: MU 07OV. Color: U6S1O1 Opal Clay. Temple Size: 140 mm. Lens Size: 52 mm. Bridge Size: 17 mm. Model: VMU07O U6S1O1. (Opal Green Color Available ). Color: Opal Green available. · No Local Pick Up. New eyeglasses only (no other accessories included). - 100% Authentic. Model: GX 027. Lens Width: 51 mm. Color Code: GRN. Temple Color: Dark Green Multi-Color. Bridge Width: 18 mm. Accessories: No case. Temple Length: 135 mm. Chanel 3341 c.1561 Black/ Green Gradient.New 100% Authentic Eyeglasses. The size is: 54mm 16mm 140mm. Made in Italy. Model: Jimmy Choo JCH Jc153 Eyeglasses. 100% Authentic. What's included. Versace MOD. 3237 5211 Clear Green on Gold. New 100% Authentic Eyeglasses. The size is: 52mm 17mm 140mm. Made in Italy. New Versace 3205-B Eyeglass Frames retail price $300!! Chanel 3324 c.1531 GreenNew 100% Authentic Eyeglasses. The size is: 52mm 16mm 140mm. Made in Italy. You are looking at a pair of exclusive CHANEL 3322 Eyeglasses. These Chanel 3322 glasses make a great addition to your outfit and you can be assured they are well-crafted for durable and daily use. Stripping down all the fuss and frills and keeping everything minimalistic. Model:HC 6017 Vanessa. This Coach HC 6017 Vanessa eyeglasses make a great addition to your outfit and you can be assured they are well-crafted for durable and daily use. Save your money and get them here! Jason Wu eyeglasses combine an inherently chic connotation with sleek modern finishes using unusual materials and details. These eyeglasses are not trendy, they are about being a part of and building a complete wardrobe. Don’t settle for anything less. We are two 30 year Opticians bringing you great product at great prices. A bargain at twice the price! Don’t be left without! We are two 30 year Opticians loving life and what we do. 💎New Authentic Dolce Gabbana DG 3215 2891 Yellow Havana & Green Eyeglasses 54/16/140 with Case & Cloth. Case is authentic but size or color may vary. We have over 35 years experience serving the Optical industry. 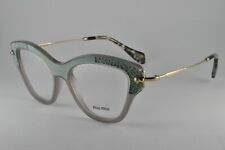 Versace MOD 3230 5193 Army Green w/ Black Temples and Gold Accents. New 100% Authentic Eyeglasses. The size is: 54mm 18mm 140mm. Serial number engraved on the right temple to avoid imitation from the manufacturer. COLOR:RRZ GREEN HAVANA. LENS COLOR:CLEAR DEMONSTRATION WITH PRINT. TEMPLE LENGTH :130 MM. Prada eyeglasses. Prada case. Original box, case, cloth, booklets etc. MODEL NUMBER:PR12VV. COLOR:4761O1 TRANSPARENT GREEN GRADIENT & HAVANA. WE DO NOT FILL PRESCRIPTIONS FOR THE GLASSES LENS. LENS WIDTH (EYE SIZE ) :52 MM. (SUNGLASSES LENS ARE AS LISTED). LENS COLOR:CLEAR DEMONSTRATION WITH PRINT. NEW LACOSTE EYEGLASSES. LACOSTE HARD CASE INCLUDED. Versace Eyeglasses. Made in Italy. TheseTory Burch TY2027 glasses make a great addition to your outfit and you can be assured they are well-crafted for durable and daily use. Save your money and get them here! The pictures cannot fully reflect the beauty of this piece of designer eyewear. New Authentic Dolce Gabbana DG 3215 2891 Yellow Havana & Green Eyeglasses 54/16/140 with Case & Cloth. Case is authentic but size or color may vary. We have over 35 years serving the Optical industry. Model VO (2841-2138). Temple Length 140 mm. Lens Socket Width 54 mm. Color Light Green. Bridge Size 16 mm. Age Group Adult. Style Oval. Lens Color Demo Lens. MODEL : BEAUTY. COLOR : GREEN. CONDITION : NEW WITH DEMO LENSES. CASE NOT INCLUDED.